After almost 40 years, Elizabeth Sloan-Ragland (shown left) made a second trip to Samford University. This time she was invited. The first time she was escorted by her mother and aunt to become the first African American woman in the history of Samford to live in a residence hall on campus. This time, she was welcomed with a standing ovation from the student body at the conclusion of her address to them in convocation. The first time, she was welcomed by an individual--dean of women Martha Cox, who escorted her to a private room on the first floor. Now retired, Dean Cox was present for Sloan-Ragland's remarks Feb. 26 in Reid Chapel. "Thank you for inviting me," said Sloan-Ragland, a longtime staff member of Alabama A&M University and manager of its WJAB-FM 90.9 radio station. She admitted that she had brought a CD rendering of a gospel choir to play for the occasion but was greeted with a gospel choir performing before her address. "Things have changed," she acknowledged, "but not enough. Progress has been made but a lot more has to be done. And each of us as individuals, though a small part, can make a difference but we have to do it as both black and white persons," she said. Sloan-Ragland then shared her story "of a little girl who grew up in Oxmoor, Ala., attending Rosedale High School in Homewood and had the wonderful fortune of attending this university." It was while she was a high school student at Rosedale that Dr. Wayne Flynt, then a Samford history professor, led a group of students to be tutors there and influenced Sloan-Ragland to attend Samford. "Because of you and others, including my high school counselor, I came to Samford," she said to Flynt, who was present. "I thank you, I salute you, and I love you for what you did," she said. Sloan-Ragland majored in speech and drama because of the influence of her father, "who signed his name with an X but knew the value of an education." She acknowledged, however, that she stood on the shoulders of others blacks who had sacrificed their lives to open the doors of opportunity for her. She spoke of Samford then and now, and particularly of how the institution and people had evolved into what both are today. For example, she recalled, that when she enrolled in 1969 there were only three black basketball players and one black football player attending. Today, the president of the Student Government Association, Cameron R. Thomas, who was present and presented a plaque to Sloan-Ragland at the end of the event, is African American, there is a gospel choir and many black students are enrolled in both academic classes as well as athletics. "While a lot still needs to be done, a lot has changed," she said. "The world never stops turning, through triumphs and tragedies, and we must do our part." Sloan-Ragland praised the value of an education and suggested that we do not need a color-blind society. "We have more in common than our differences," she said. "Our differences enhance all of us and the immigration of ideas beyond our own is important. You are better than when you came here and we must respect each other and their ideas." Of her 40-year journey, Sloan-Ragland said, "I am so pleased I made the journey." She thanked all who had a part in making the journey possible. "I love you and I love this university because my years here helped to give me a life," she said to a standing ovation. Sloan-Ragland has been employed at Alabama A&M since her graduation from Samford in 1973. Currently, she is director for Alabama A&M's Telecommunications and Distance Learning Center in addition to her post with WJAB FM 90.9. 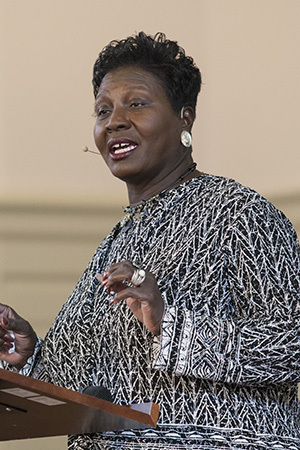 She spoke at Samford as part of Black History Month.